Syracuse, NY. Gustav Stickley House. Work on temporary roof protection. Photo: Samuel D. Gruber May 2012. In early March I wrote and posted photos about the deplorable condition of the Gustav Stickley house on the East Side's Columbus Avenue, thus breaking a long-suffering silence about the fate of this important CNY site. To my mind the house is the single most influential residential building in Syracuse, having helped define and then witness the Craftsman Movement and its magazine. Whether my public complaining and posting of photos had an influence - or whether it is just the Zeitgeist - I do not know. But I can report that there has been a lot of talk about the house in the last two months, unpublicized site visits and now some much needed - though still short term - attention to the roof. Anyone who has passed by on Columbus in recent days has seen a lift and men at work, apparently laying new protective sheeting on the roof to better make the structure watertight. The house was fortunate to have escaped a harsh winter, but still every rain can bring water into those old wood walls fostering interior rot and bringing damp and decay to plaster walls and ceiling and wood and paint finishes. The damage is not always visible when it happens - it often only appears when things are dried out and plaster crumbles to dust. There is still no public word on the future of the house but there has been quiet discussion in Central New York's culture community. The wheels of planning in our community work slowly, and sometimes stop altogether. I've heard some alarming proposals - and some really wonderful ideas. I hope the latter win out, but as always in our region money needs and expediency will compete. Will CNY take the long view and create a lasting urban and cultural resource we can be proud of, or will we settle for a quick fix and an easy sale to temporarily solve the problem? I post this entry to keep the pressure on, with the hope of building, or at least encouraging momentum. I group the options into four main categories - and I hope we can safely forget the first. 1. Ignore the building, let decay continue and the building go to hell, until it look like every neglected and abandoned house in the city. Curiously - the Stickley house is now the WORST looking house on this block of Columbus. Other people are caring for their properties much better than I have seen in nearly years of watching the street. 2. Ignore the building (and screw the neighborhood), but strip it's historic artistic interior features for donation or sale. We know these fixtures would fetch a high process in today's overheated Arts & Crafts market. There are also all sorts of museums and cultural institutions locally and nationally that are salivating to get these pieces. While most will declare "we would never never strip an historic buildings," privately they'll go on to say with an implied wink "but if someone else did and we were offered the pieces, or we saw them for sale at auction, of course we would be interested." So, to my mind, losing the Stickley interior to some other region of the country is a distinct possibility. After all, a medieval manuscript in the OCPL was sold a bargain price to a collector in the 1990s, the county sold off large segments of the Salt Museum collection, Liberty Diner went to a museum in Rhode Island, Tiffany windows from South Presbyterian Church were sold to a collector in California and now the fittings, furnishing and windows from Holy Trinity may leave town for New Orleans. So let's not kid ourselves - losing Stickley is a distinct possibility! Of course, if the building is neglected long enough (see option 1), then stripping the building becomes the munificent thing to do. Once again, demolition by neglect. 3. A third option would be to turn back the clock and put the building to work again. Some not-for-profit or even a private individual should buy the building or (given the cost of restoration) receive it as a gift, and then restore it with the Stickley downstairs intact and open to view on a schedule or by appointment, and perhaps used for meetings and lectures, with the upstairs floors used again as apartments. Income from apartments could help maintain the building, and perhaps house an on-site caretaker. A better version of this would be a similar plan, but run by a not-for-profit, and the apartment could serve visiting Arts & Crafts scholars or artists, and also house a caretaker. Perhaps a working Arts & Crafts library could be installed. This gets close to what the Arts & Crafts Society wanted to do in the 1990s. Something along these lines was quietly floated by representatives of the Audi family and Stickley a number of years ago, but all the interested small organizations realized they didn't have the money, means, staff or stamina to carry out such a project. The heavy hitters - SU, ESF were not interested (then). SU was just turning its attention downtown to the Warehouse and then to the Near West Side. ESF was embarking on its expansion plans to the west as well. OHA and the Everson - the logical history and art institutions with real ties to the Stickley legacy were struggling then (as they always are) to meet their annual budget needs and to maintain their own buildings. OHA was in the midst of a move and expansion to its new building on Montgomery Street (with its facade and windows now beautifully restored!). The Everson still officially had its multi-million dollar expansion plan on the table. This, thankfully, seems now to have passed its moment. Today, however, things are better. It is conceivable that any of these four institutions (SU, ESF, OHA or the Everson) could implement a version this option. 4. And then there is the best case scenario...this would take option three, but ratchet it up a notch so that the Stickley House would not just survive as working house, but would be turned into a full-service research and exhibition center for Central New York's famous (and continuing) Arts & Crafts Movement. Under the auspices of OHA and/or the Everson, the house would be restored supported by nationally-gathered tax-deductible donations and tax-credits where appropriate. The house would have galleries for permanent and temporary exhibitions, office space and still (perhaps) house a top floor caretaker's apartment. The house would function as a satellite museum with regular hours. There would be difficulties beyond the money (minimally many millions of dollars for restoration, installation, security, curatorship, etc.). A zoning change would be needed. Parking would be required - perhaps including the demolition of at least of the later structures on Columbus. But still... I can cite the success of many similar projects in this country and abroad. The idea is a idealistic, but also realistic, and should be seriously considered - and championed. Personally, as an art historian, local historian, collection curator, historic preservationist, cultural heritage consultant and neighborhood resident I could live with either option 3 or 4. But this is Syracuse. This time, let's be inspired, let's not settle for second-rate. Let's do something really great, really noticeable, and something that will be on the map not just for us, but for the entire world. The Stickley house is a small building - but it can have a big big impact! Readers....what do you think? Let me know, let your elected officials know, and let our cultural leaders know. PACNY members $10, all others $15. Werner Seligmann (1930-1998) is arguably Central New York’s best known modern architect. As a practicing architect, influential teacher and a Dean of Syracuse University’s School of Architecture, he put his stamp on New York State design, and shaped the architectural aesthetic of several generations of architectural students and professionals. Born in Osnabrück, Germany, Seligmann spent the latter part of World War II in a concentration camp; unfortunately his mother and sister did not survive the camps. After the war he was sent to the US to live with relatives in Groton New York, beginning his long association with Central New York. Seligmann received his Bachelor's in Architecture degree from Cornell in 1955. He was licensed in 1956 and taught as an Instructor at the University of Texas at Austin from 1956-58, where he became part of a small group of faculty that would later be nicknamed The Texas Rangers; a group that included Colin Rowe, John Shaw, Robert Slutzky and John Hejduk. After the group was dismissed from Austin, Seligmann pursued graduate study in Braunschwieg, Germany, then taught at the Eidgenossiche Technische Hochscule (the ETH), in Zurich, Switzerland from 1959-61. He returned to New York State to teach at Cornell from 1961 to 1974, then spent two years as Associate Professor of Architecture at Harvard, before becoming Dean and Professor of Architecture at Syracuse University, where he served from 1976-90. Seligmann was subsequently named Distinguished Professor of Architecture at Syracuse University, a position he held until his death. Throughout his teaching career Seligmann maintained a practice and entered many competitions. His firm, Werner Seligmann and Associates, Architects and Urban Designers, was launched in 1961, and was based primarily in Cortland, New York. Seligmann won two Progressive Architecture Design Awards, was illustrated on the cover of PA three times, and has placed or won several national and international design competitions. His work on developing housing prototypes for the New York State Urban Development Corporation in the 1970’s and 1980’s established his reputation in the area of housing. His buildings are meticulously detailed, technically researched and spatially inventive. 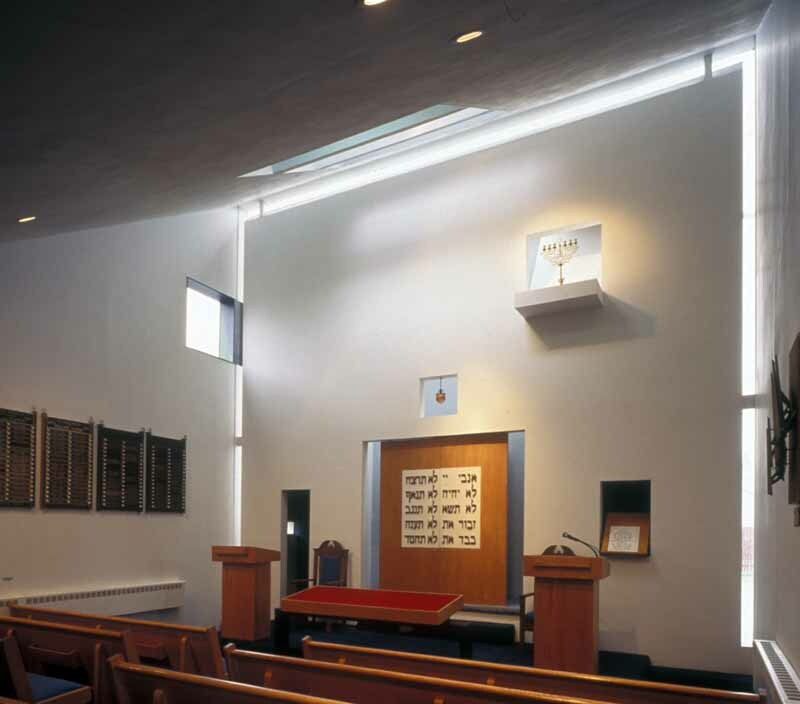 His synagogues in Binghamton and Cortland are widely regarded as important contributions to modern religious architecture. Click here to read more about this synagogue. Bruce Coleman is Professor of Architecture at Syracuse University where he has taught since 1976. In private practice, Coleman worked with Joseph Cerutti & Associates in Cleveland and then worked ten years as an architect with Werner Seligmann & associates in Cortland, New York. Coleman’s teaching focuses on computer-aided design (CAD) and he was instrumental in setting up the shared IBM CAD lab at Syracuse University. In his private practice he has focused on residential and religious work. Coleman is completing a monograph about the work of Werner Seligmann. This lecture presents some of the projects described in the monograph as well as analysis and conclusions about Seligmann’s influence – during his life, and today. Researching recent walking tours in the Westcott neighborhood has allowed me to look more closely at many streets and houses. I continue to be surprised at what turns up. One such house is located at the northeast corner of Columbus Ave. and Hawthorne Street. It seems modest now, but a Post-Standard newspaper story about its erection by Daniel Rosenbloom (with photo) from May 1901 shows that the house was exceptional. It was a "well appointed Gothic structure." It is not clear whether Rosenbloom built this house for himself (he was a well-to-do civic-minded bachelor who lived on 704 East Jefferson according the city directories of the time). Most likely he was building to sell - as he apparently did with the Stickley House, erected a few lots down. Syracuse, NY. Daniel Rosenbloom house at 201 Hawthorne St. illustrated in the Post-Standard, May 19, 1901. Well Appointed Gothic Structure Just Completed in Columbus Avenue. Daniel Rosenbloom has just completed at Columbus avenue and Hawthorne street a well appointed one family residence. The house was erected from plans prepared by Architects Wellington W. Taber and F. C. Draper. The style of the house is Gothic, with a foundation of split field stone. The first story is clapboarded and the second shingled. The first floor is done in oak and the second story enameled in soft tints, and the side walls and ceiling on both floors are painted in effective and harmonious colorings. The grounds surrounding the house have been prettily laid out. Mr. Rosenbloom will build this summer another handsome and costly house, to be occupied by Isaac Rosenbloom. It is believed it will be located near Forman Park. The house is still very similar to its original appearance - except that the Gothic arched porch on the Hawthorne facade is now filled in, and a new small covered entrance has been erected on the Columbus Avenue side. The exposed walls of the foundation are laid up in fancy stonework into which are set several small windows with Gothic-style pointed arches. A smaller house is close by to the east. This appears to have already been standing. The east wall of the Rosenbloom house is brick - probably built as fire protection since the 203 Hawthorne was only a few feet away. for details about their construction. Rosenbloom and neighboring house. The blue house (203 Hawthorne) immediately to the east seems to have been already constructed, so Rosenbloom and Taber built their east wall of brick - presumably for fire protection. Note the Gothic arches of the basement level. House seen from the northwest, with Columbus Ave. facade. Daniel Rosenbloom was a member of one of Syracuse's most prominent Jewish families. B. G. Rudolph provides information about the Rosenblooms in From a Minyan to a Community: the History of the Jews of Syracuse (Syracuse Univ. Press, 1970). Daniel Rosenbloom was born in 1851 to what would become one of Syracuse's most prominent Jewish families. He was one of eight children of Solomon (1822-1896) and Hannah (1827-1884) Rosenbloom who had settled in Syracuse in 1847, emigrating to America from Altenheim, Bavaria. Solomon was trained as a shoemaker, but like many German-Jewish immigrants of his generation but began as a peddler to raise capital to start his own business. 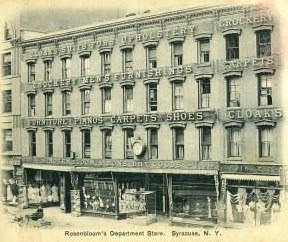 He opened a shoe store in the Bastable Building, and his sons Marcus (1849-1919), Daniel, and Simon (1853-1923) joined the business, renamed S. Rosenbloom & Sons. Solomon essentially removed himself from the business to devote time to Jewish community concerns. His sons were very successful, developing one of the largest department stores in Syracuse with branch stores in Utica, Oswego, Auburn and as far away as Providence, Rhode Island and Akron, Ohio. While his sons rose to become leading Syracuse citizens, Solomon especially immersed himself in the local Jewish community. He was founder and financial pillar of Congregation Adath Jeshurun, founded in 1864 by the more traditional faction of Temple Society of Concord when that synagogue (Syracuse's first) adopted Reform practice beginning in 1861. 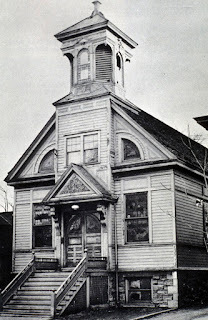 In 1887 Solomon funded the erection of a new building for Adath Jeshurun on Orange Street (now McBride) between Madison and Harrison Street, which was commonly referred to as "Rosenbloom's Shul." He and his sons supported the observant congregation for sixty years, until it merged back with Temple Concord in 1925, which the surviving Rosenbloom family members rejoined. Solomon also founded a cemetery at West Colvin and Jamesville Rd., still known as the Rosenbloom Cemetery. He and most members of his family are buried there. Daniel was the most civic-minded of Solomon's seven sons. He was known as a businessman, philanthropist and was involved in local politics. He was served on the board of the public library, was a member of the Board of Education (the first Jew to hold this office) and served as president for four years. Daniel was offered the Democratic nomination for mayor, which he declined due t his poor health. Daniel died in the summer of 1905. According to an Post-Standard article of August 28, 1905, "Death was due to diabetes, for which Mr. Rosenbloom sought every known remedy and medical advice. He went to Carlsbad, Germany, three times, consulted with one of the most illustrious medical authorities in Berlin and with the now famous Dr. Osier of Baltimore, who recently left for Oxford, England, but secured no relief." Syracuse, NY 126 Victoria Place. Rosenbloom's and Taber's choice to build a "well appointed Gothic structure" was somewhat unusual in 1901. 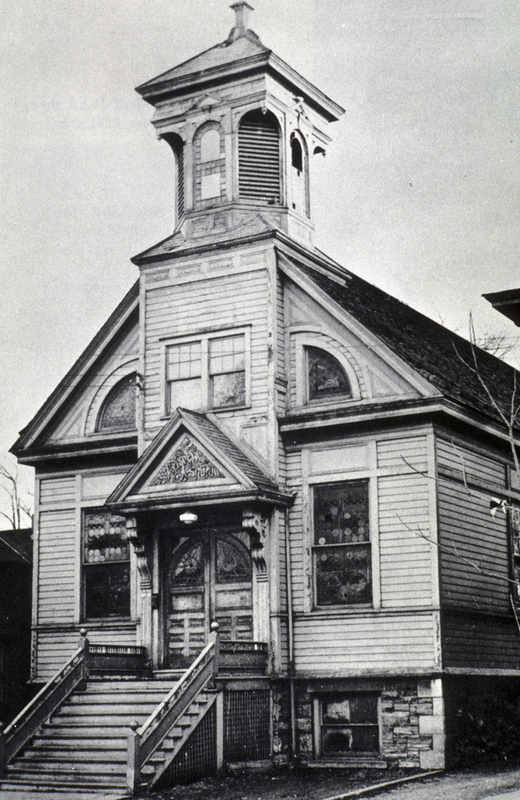 After the mid-19th century (see Gothic Cottage) the Gothic style was rare in American residential architecture, and at the turn of century is was more commonly used for churches. There are only a few houses in the Westcott neighborhood with any Gothic details at all. 126 Victoria Place, probably built in the mid-1890s, is an American four-Square house with a classical porch. There are, however, two small Gothic windows centrally set in the main facade. On nearby Allen Street, two houses developed by Jame W. Pennock and built ca. 1905, at least one of which (#420) was designed by local architects Gaggin & Gaggin, show a much tamer type of pointed arch on their porches. Other than these nearly flat pointed arches, nothing else suggests the Gothic style. I'll write about these and other houses on Allen Street in a later post. N.b. All photos by Samuel D. Gruber except "Rosenbloom Shul" (originally B. G. Rudolph, From a Minyan to a Community (1970), originally Onondaga Historical Association).